fring for iPhone has arrived! 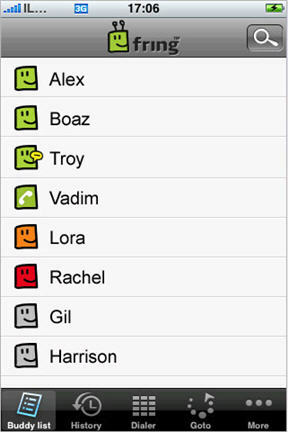 I'm a huge fan of fring, which I like to call the Swiss Army knife of VoIP/IM communications since fring works with AOL/AIM, MSN Messenger, Google Talk, Skype, Twitter, Yahoo Messenger, and SIP registrars/IP-PBXs. I've used fring on my Windows Mobile 6.1 phone to connect to an Asterisk-based IP-PBX using SIP which enabled me to remotely make and receive calls. fring is a currently a free pre-release app free on iTunes. VoIP using fring is of course restricted to WiFi connections - it won't work over 3G, but still cool nonetheless. Further, according to the apps description in iTunes you can IM over 3G, GPRS, EDGE, or WiFi, so you can use fring as your centralized IM application on your iPhone. Download fring (free app) for iPhone here. 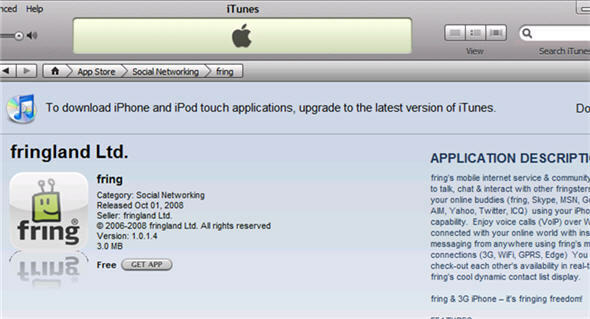 \nMessenger, Google Talk, Skype, Twitter, Yahoo Messenger, and SIP registrars/IP-PBXs. I've used fring on my Windows Mobile 6.1 phone to connect to an Asterisk-based IP-PBX using SIP which enabled me to remotely make and receive calls. fring is a currently a free pre-release app free on iTunes. \nVoIP using fring is of course restricted to WiFi connections - it won't work over 3G, but still cool nonetheless. Further, according to the apps description in iTunes you can IM over 3G, GPRS, EDGE, or WiFi, so you can use fring as your centralized IM application on your iPhone. \nDownload fring (free app) for iPhone here.